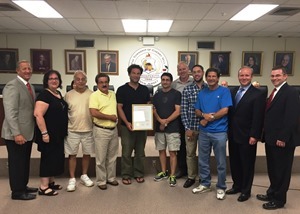 Mayor Chuck Cahn honored the members of the Woodcrest Red Men's Volleyball Team at the Township Council meeting on Wednesday, Sept. 16, for being crowned champions of this year's Cherry Hill Association of Pools Volleyball League. Joined by Council President Dave Fleisher and Council members Brian Bauerle and Melinda Kane, the Mayor presented the team members with a special proclamation commemorating their championship season. Woodcrest Red and wrapped up its season with a victory over Kingston Swim Club on Aug. 8, ending the championship tournament with an impressive 9-1 record. Congratulations to the entire team: Captain Mike Kon, Alfred Arcaroli, Jeremy Gardner, Rob Kolmins, Boris Kon and Rob Spier.